(16/26) TRENTON – Based on comprehensive new scientific information, including extensive data compiled by the U.S. Geological Survey, the Department of Environmental Protection plans to propose amended septic density standards for northern New Jersey’s Highlands region. The proposal will continue to provide high standards of water quality protection, while providing modest opportunities for job growth and economic development where appropriate. “The proposed septic system density standards provide a common sense, science-based approach to protecting the region’s precious water supplies, while creating reasonable additional opportunities for economic growth and jobs,” said DEP Commissioner Bob Martin. The DEP will formally propose the amendments through publication in the New Jersey Register on May 2. They are based on tens of thousands of water quality data points, compared with barely a few hundred when septic densities were first developed about a decade ago. The DEP is proposing amendments to rules promulgated under the Highlands Water Protection and Planning Act that relate to three Land Use Capability (LUC) zones. The changes are based on significantly increased sets of data compiled by the USGS since the Act was adopted in 2004. The current septic density standards allows for one individual septic system for every 25 acres in non-forested areas and for every 88 acres in forested areas. Under the proposed rule, no more than one individual septic system would be permitted for each 23 acres within the Protection LUC zone. No more than one septic system would be allowed for each 12-acre lot in the Conservation LUC Zone. Finally, no more than one septic system would be allowed for each 11-acre lot in the Existing Community LUC Zone. The DEP calculates that the actual net increase in the number of septic systems that would be allowed under the proposed rule will be minimal, about 12 percent more than allowable under current regulations due to other existing environmental, land use and local zoning constraints, while providing opportunities for appropriate economic development and preservation of rights of property owners. 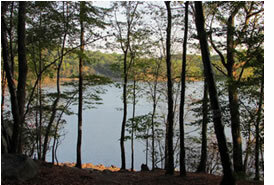 DEP calculates one septic unit per 362 acres of the Preservation Area of the Highlands. The proposed standards are consistent with the Highlands Act, which requires the DEP to set septic density standards established at a level to maintain existing water quality. This rule maintains the highly protective measures put in place in 2007, but updates the septic density standards based on the newly developed scientific analysis by the USGS. The DEP developed the proposed rule after commissioning a peer-reviewed and published study of nitrate levels in the Highlands region by the USGS. The results were also reviewed by the DEP’s Science Advisory Board, DEP’s Division of Science, Research and Environmental Health and the State Geologist, and found to be scientifically sound. The DEP also held a series of outreach meetings with various groups, including local officials and planners, environmental advocacy groups, the Highlands Coalition, the New Jersey Farm Bureau and New Jersey Builders Association. The Existing Community Zone consists of “areas with regionally significant, concentrated development signifying existing communities” that “tend to have limited environmental constraints … and may have existing infrastructure that can support development and redevelopment” and comprises 32,896 acres. The Highlands region consists of 88 municipalities in seven counties, including 52 that are either partially or fully within the Highlands Preservation Area. Under the Highlands Act, the DEP uses nitrates, a type of nutrient found in septic waste, as a gauge to protecting water quality. Septic density formulas are based on the acreage of land necessary to dilute nitrates to levels that will not adversely affect water quality. In 2008, the septic density standards DEP promulgated under the Highlands Act were legally challenged as lacking scientific foundation. The Appellate Division of Superior Court found that litigants raised substantial questions regarding the reasonableness and scientific justification for the standards that were promulgated at the inception of the act that allowed one septic system for every 88 acres of forested area and one septic system for every 25 acres that is not forested. The proposed standards are the product of a thorough scientific evaluation of the rules, including reviews of data from thousands of samples from septic systems and groundwater, improved land use cover maps, and GIS data. The DEP will also provide a 60-day comment period for the rule revisions after it is posted in the New Jersey Register and will hold a public hearing on June 1 at the New Jersey Highlands Council building at 100 North Road in Chester.